The thought of early season angling has changed immensely since I began fishing. Fishing, except for ice fishing which never really made much since to me, was a warm weather sport, and you had to wait for opening day if you wanted to fish. 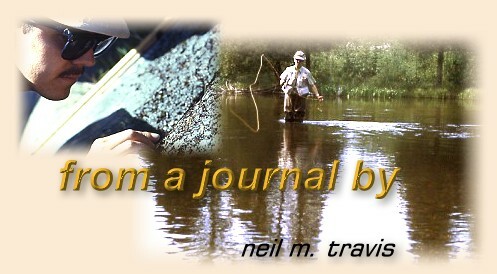 In the North Country trout season opened in April or in some cases early May, and it was a date highly anticipated by the faithful who had been tying flies all winter and looking wistfully at tackle catalogues. For many it was an annual ritual that involved more socializing than actual angling. Opening day was Christmas, your birthday, and winning the lottery all rolled into one day. Today most fisheries are open the entire year. Some may have tackle and possession restrictions during the winter months, but the dedicated angler can usually find someplace where he can legally wet a line even during the darkest months of winter. However, for many anglers the coming of spring marks the beginning of their angling year, and if you are among that group the time has come for you to finally vent your pent-up frustrations and get your waders wet. Early season angling has much in common with shooting craps or Russian roulette. You pay your money and take your chance, but there are some things that the angler can do to help narrow the odds. First, adjust your expectations to bring them in line with reality. Water conditions are unlikely to be ideal for angling. Too high, too cold, or still frozen are some of the conditions that the early season angler may encounter. Fish are likely to be lethargic due to low water temperatures and successful anglers will need to adjust their technique accordingly. Hatches, if they occur at all, will be limited to the warmest part of the day, and they may be sporadic and limited in both duration and scope. Even a fairly strong hatch may fail to bring fish to the surface restricting the angler to using nymphs and other subsurface imitations. The second key to tilting the odds in your favor is planning. As in most aspects of life, planning is essential to success but it plays an inordinately important role during the early part of the season. Unless you live very near to the place where you are planning to fish it is imperative to find out about the current local conditions. Don't presume conditions will be like they were in previous years, or the reports you have read on the Internet are correct. A couple phone calls to someone who lives there, a trusted fly shop or local guide service might prove to be the best investment of time and effort you could make. Despite all the planning remember that spring is a time of transition and the best of plans may suddenly be turned upside down by an unpredictable change in conditions. I remember well an early season fishing trip to Yellowstone National Park. The fishing season in the Park opens the end of May, and this particular year we had been experiencing a run of very nice weather with daytime temperatures in the upper 50's with plenty of warm sunshine to cheer the spirits after a long winter. The weather forecast was encouraging, but the reality of what occurred was anything but encouraging. We left home that morning bound for the Firehole River, which is less than 100 miles from my doorstep in Montana. It was cool with a slight north wind blowing when we drove through the north entrance at Gardiner, but by the time we arrived at Fountain Flats the slight north wind had turned into a gale and heavy snow was beginning to fall. Soon the wind was blowing the snow sideways and the temperature was dropping with equal vigor. We barely made it out the entrance at West Yellowstone before they closed the road. This unpredicted spring snow storm lasted for three days! So much for planning.